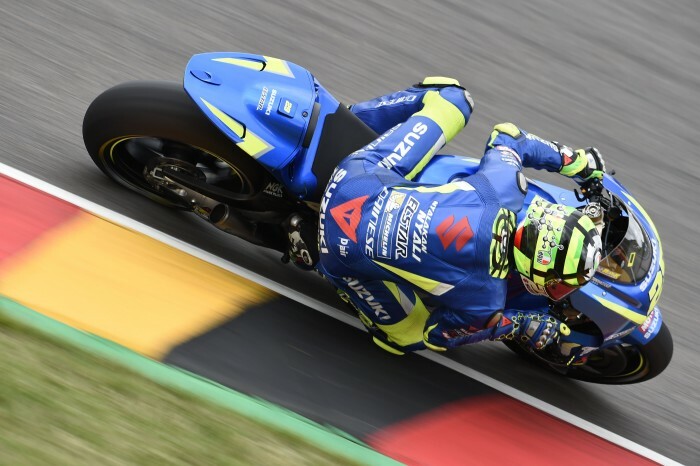 Ecstar Suzuki’s Andrea Iannone put the soft rear Michelin to good use in the closing minutes of today’s opening MotoGP free practice at the Sachsenring, stealing top spot from reigning champion Marc Marquez by almost four-tenths of a second. Marquez had led the entire session, putting in a 1’21.832 on the medium rear on his seventh lap which remained the benchmark until Iannine dropped his 1’21.442 on hid 18th lap of 24. Movistar Yamaha’s Valentino Rossi hopped into third place with his final lap, setting a 1’21.964 on the medium rear which demoted team-mate Maverick Vinales to fourth with his 1’22.154. Andrea Dovizioso was the leading Ducati in fifth just ahead of Danilo Petrucci with the Italian’s team-mate Jack Miller jumping up to seventh with his last lap, using the hard rear to set a 1’22.415. His time pushed Jorge Lorenzo down to eighth. Scott Redding finished the morning in ninth place, one ahead of Johann Zarco with Taka Nakagami and Alex Rins, who suffered a crash, completing the top 12. Dani Pedrosa ended in 14th and it was disaster for Cal Crutchlow who could do no better than 19th but at least he stayed on.